J.B. Barrett of the Beavercreek Bombers applies the tag to a Peace Lutheran baserunner at second base, during Tuesday’s 6 p.m. Coed Softball League action at Beavercreek’s Rotary Park. The Bombers won the game, 11-4 to remain undefeated this season. 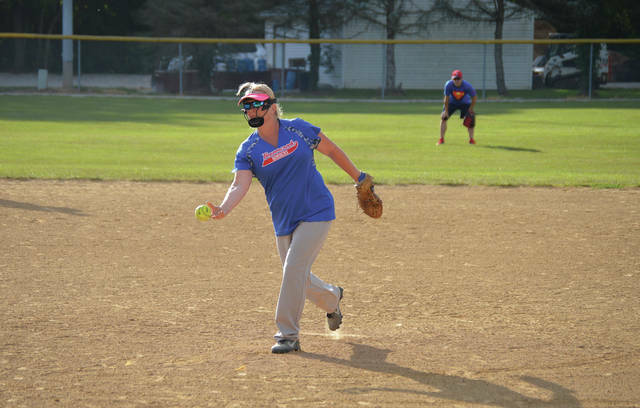 Bombers pitcher Lisa Rondeau struck out five Peace Lutheran batters in Tuesday’s win in Tuesday 6 p.m. Coed League softball at Rotary Park in Beavercreek. That’s Bombers coach Joshua Clymer in the outfield. Todd Smith swings at a pitch for the Beavercreek Bombers, Tuesday July 17 at Rotary Park in Beavercreek. Emma Rondeau leaps to make a catch at first base as Beavercreek Bombers teammate Lisa Rondeau looks on, during the later innings of Tuesday’s July 17 win over Peace Lutheran, at Rotary Park in Beavercreek. BEAVERCREEK — They’ve played together for roughly five years or so, and it definitely shows. 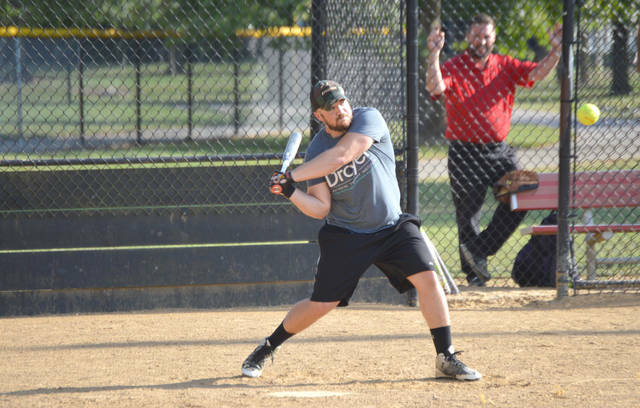 There’s plenty of reasons for the Beavercreek Bombers to be undefeated in the Beavercreek Parks Recreation and Culture Tuesday 6 p.m. coed softball league. The biggest reason? They’re talented, throughout the lineup. If a player isn’t hitting the ball on offense, they’re gunning down base runners or making the catch on defense. It’s hard to pitch against a team with few weaknesses in its lineup. 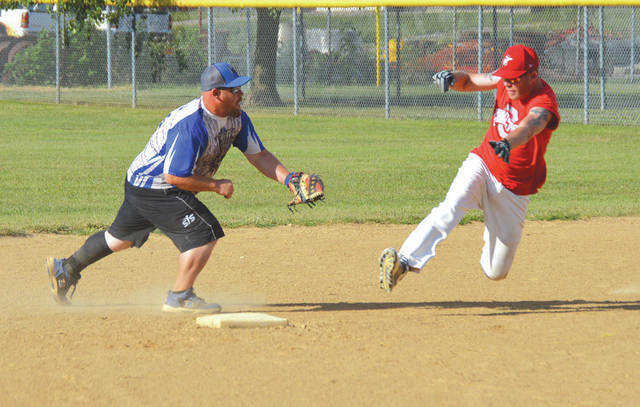 In a July 17 game between the first-place Bombers and one of the two second-place teams in the league, Peace Lutheran Church, the Bombers pulled in front early and just kept piling on the runs in a solid 11-4 win. Peace Lutheran led the league in run differential, with a 5.67 average scoring margin prior to the game. The Bombers were second in the eight-team league with a 5.17 margin average. So the contest between two of the league’s three front runners (the Daniel Perkins team entered the day at 5-1 as well) promised to be a good one. The Bombers broke open a relatively close 5-2 contest in the fifth or six inning by loading the bases and eventually scoring five runs to jump ahead 10-2. Peace Lutheran battled back with two more scores, but Beavercreek tagged on another insurance run in the sixth for the game’s final margin. 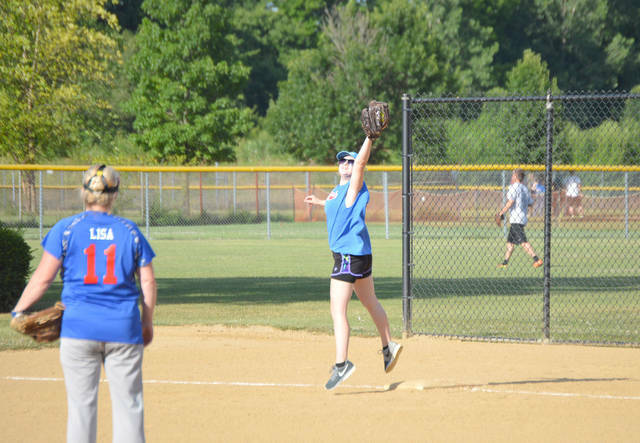 Pitcher Lisa Rondeau struck out five Peace Lutheran batters, quite a feat in slow-pitch softball. To help speed up the game, batters start off with a one-ball, one-strike count. Perhaps the defensive play of the game happened in the third inning, when a Peach Lutheran heavy hitter attempted to stretch a deep single into a double. Centerfielder/coach Josh Clymer made a bullet throw from left center field to second baseman J.B. Barrett who tagged the runner out in mid-slide. The Bombers are comprised of a dozen players, including three husband-wife couples and a mother-daughter duo. Players are: Chris Michael; Bri Clark; Todd Smith; Rob Strong; Josh and Alisha Clymer; Lisa and Emma Rondeau; J.B. and Sarah Barrett; and Johnny and Sara Mennecke. The players hail from all over the Greene County/Miami Valley area, with Beavercreek, Xenia, Spring Valley, Kettering and Dayton among some of the home towns. With Tuesday’s win, Beavercreek is now 7-0 this season. They’re scheduled to take on Daniel Perkins, the league’s other second-place team as of July 17, for the Bombers’ next game at 6 p.m. on July 24 at Rotary Park. Teams in the 2018 Tuesday 6 p.m. Coed League are the Bombers, Peach Lutheran, Daniel Perkins, Don Ehrhart Construction, The Fighting Amish, Team Groot, First Baptist Church of Dayton, and Longhorn.